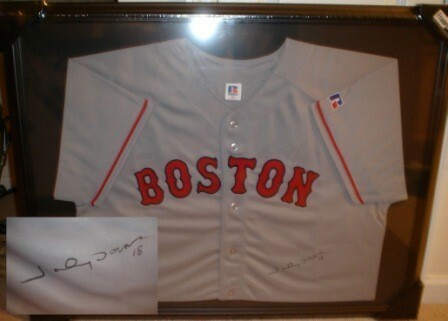 This Boston Red Sox jersey has been hand signed by former Red Sox star Johnny Damon and professionally framed by Collectibles of the Game. Your autograped memorabilia deserves to be displayed properly, and this high quality framing ensures that it will be protected and also allows you to display it well in your home or office. It was signed during a private signing with Exclusive Sports & Promotions, and includes a Certificate of Authenticity from Collectibles of the Game.